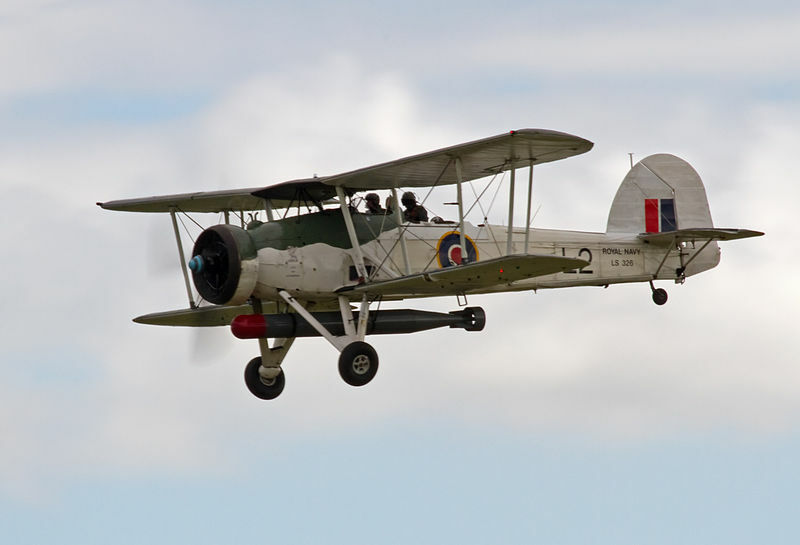 A restored Fairey Swordfish in flight. Stringbag Mild Ale is the second in our easy, surefire recipe series. In this series of extract recipes, we present brews that are easy to make (no yeast starter, manageable amount of grains), yet great tasting and representative of their beer style. 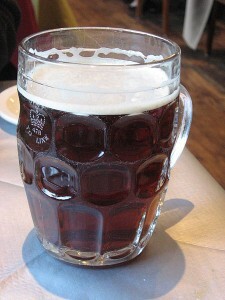 This is a mild ale — a malty, somewhat dark, session ale. This recipe uses mild ale malt and English pale ale malt, along with crystal malts and dark malts, to give the beer the aroma and flavor of a type of ale that was once one of the most popular beer styles in England. The name Stringbag is a nickname for the Fairey Swordfish, a biplane used by the British Royal Air Force (RAF) in World War II. Although biplanes were already obsolete by the beginning of the war, the Fairey Swordfish remained in service throughout the conflict as a Naval dive bomber. A Fairey Swordfish damaged the propellers of the German battleship Bismark, which allowed the British Navy to sink the vessel 13 hours later. A session ale that’s low in gravity, but full of flavor and complexity. The flavor is malty, with caramel notes and fruity esters from the ale yeast. In your brewpot, begin heating 2.0 gallons of water to a boil. Aim to reach boiling when the small mash is done. In a separate, large (8 qts. or larger) pot, heat 1.0 gallon of water to 165 °F. Place crushed grains in a steeping bag and submerge in second pot. Hold temperature around 154 °F for 60 minutes. This is a small mash. In a third pot, heat 0.50 gallons of water to 170 °F to use as sparge water. After the grains have mashed, place a colander over your brewpot, set the grain bag in it and pour the wort through it (to filter out solid pieces of grain); then, rinse it with the sparge water. Stir in half of the malt extract and bring to a boil. You should have about 3.0 gallons of wort. Do not let wort volume drop below 2.5 gallons during boil. (Top up with boiling water, if needed.) Once boil starts and the first bits of hot break show, add your hops and boil for 60 minutes. Add Irish moss with 15 minutes left in boil. Stir in remaining malt extract in last 10 minutes. (Dissolve it in a small amount of wort first to make it easier to stir in.) Chill wort to 70 °F and transfer to fermenter. Add water to make 5.0 gallons and aerate thoroughly. Pitch yeast and let ferment at 70 °F. Keg or bottle and carbonate to 1.9 volumes of CO2. Replace malt extract with a blend of English pale ale malt and mild ale malt. (You can choose the proportions, but do not let mild ale malt exceed 20% of the grain bill.) Add sufficient malt to hit an OG of 1.036–1.038 given your usual extract efficiency. Mash at 154 °F (68 °C) for 60 minutes. Boil wort for 90 minutes. Ferment at 70 °F (21 °C). In your brewpot, begin heating 7.6 L gallons of water to a boil. Aim to reach boiling when the small mash is done. In a separate, large (8 L or larger) pot, heat 3.8 L of water to 74 °C. Place crushed grains in a steeping bag and submerge in second pot. Hold temperature around 68 °C for 60 minutes. This is a small mash. In a third pot, heat 1.9 L of water to 77 °C to use as sparge water. After the grains have mashed, place a colander over your brewpot, set the grain bag in it and pour the wort through it (to filter out solid pieces of grain); then, rinse it with the sparge water. Stir in half of the malt extract and bring to a boil. You should have about 11 L of wort. Do not let wort volume drop below 9.5 L during boil. (Top up with boiling water, if needed.) Once boil starts and the first bits of hot break show, add your hops and boil for 60 minutes. Add Irish moss with 15 minutes left in boil. Stir in remaining malt extract in last 10 minutes. (Dissolve it in a small amount of wort first to make it easier to stir in.) Chill wort to 21 °C and transfer to fermenter. Add water to make 19 L and aerate thoroughly. Pitch yeast and let ferment at 21 °C. Keg or bottle and carbonate to 1.9 volumes of CO2. I think the key with extract brews is not to skimp on the quality of your steeping/mini-mash grains. For a recipe like this using good-quality English Crystal malt will make a huge difference. UK Crystal malts have a distinct flavor that is different from US Crystal malt and will really make an impact in a Mild like this. English crystal malts would work well in this very English beer. 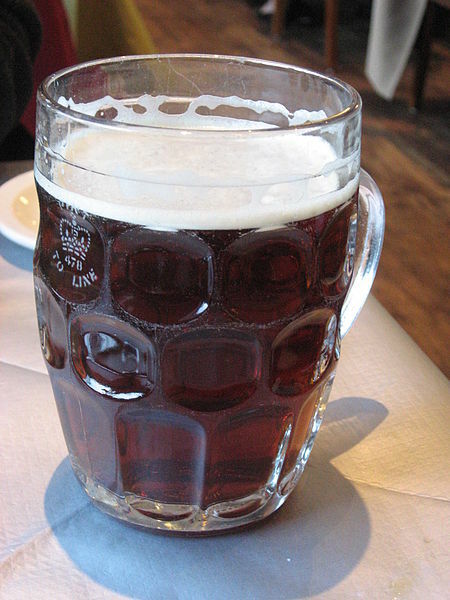 I don’t agree that US crystal malts are inferior in general (I like Briess’s crystal malt (40 °L), especially for American style pale ales, for one example), but English crystal malts in an English beer are never a bad idea. Also, knowing that different crystal malts — even those with the same color rating — are different coming from different maltsters will help you make better recipe decisions. Hi Chris, I have been on the search for a mild recipe, so excited to try this one out. I tried a Mild (from out here in Australia) a while back and it had a delicious, fresh hop flavour to it. Not sure how “on-style” this is but it tasted great. I notice in this recipe there is only 1 hop addition at the beginning of the boil, do you think flavour additions nearer the end of the boil could help me achieve that flavour? Milds are not very bitter and typically lack a lot of hop aroma and flavor. If you want that hop character, with a mild-ale-like malt background, you can spice the recipe up by adding hops late in the boil and/or dry hopping it. Kent Goldings or Fuggles would be two good traditional choices for English ales, but you could hop with anything you liked. For a little added hop character, try 0.5 oz. (14 g) of Goldings hops with 15 minutes left in the boil, 0.5 oz. (14 g) of Goldings hops added at knockout and another 0.5 oz. (14 g) of Goldings hops as dry hops. You can up all three additions to 0.75 oz. (21 g) if you’d like even more hop character. I am writing an ebook on beer brewing from home, and I need some recipes to add. Is this recipe available under Creative Commons? Please email us and we can discuss it. With proper attribution (a link to our site), I don’t see any problems.